Moving past yesterday’s snit, the spring saddleseat shows have been good for me in more ways than simply keeping me amused until I find a new horse or figure out how to ride the one I have. Previous Horse went to a few shows in his retirement years. We even earned hi-score at a dressage show. Still, we were not doing any serious showing. I rode regularly. PH would not have handled a passive retirement. But, mostly I pottled about the pasture on horse I knew well. In absence of positive data, I tend to assume the worst and deteriorate from there. When I ride too long by myself, I start comparing my progress to an unattainable ideal. That way lies madness. I need to get out among other horses and riders to remind myself that one can still be competent while being non-ideal. Plus, it’s good to learn new things. It has been good to have a challenge easy enough for me to succeed, yet hard enough that my success doesn’t feel empty. It’s good to meet friendly, pleasant horses. Even the grumpy ASBs I’ve met want love. Kinda. Four shows, nine classes, five blues. 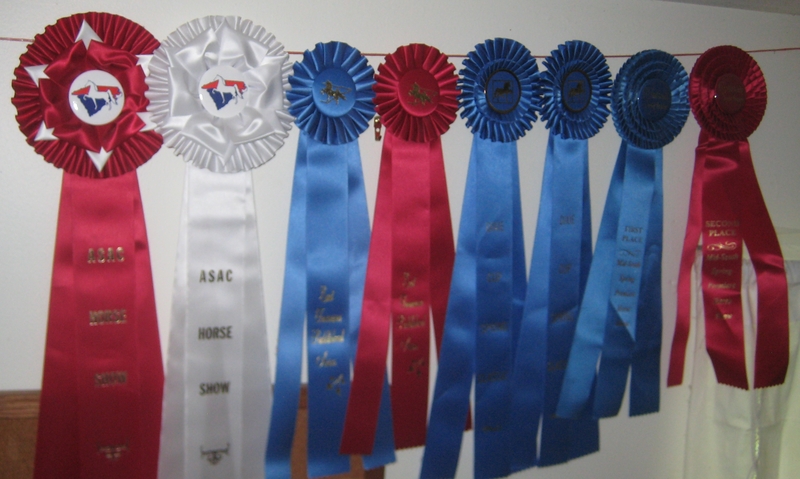 The blues include a sweep from the Georgia show [Show Report, humorous ribbon photo]. It’s hard to think of two as a sweep but I did win everything I entered. The crop of reds is less impressive than it looks. My classes have been tiny. The white (4th) was a last place. 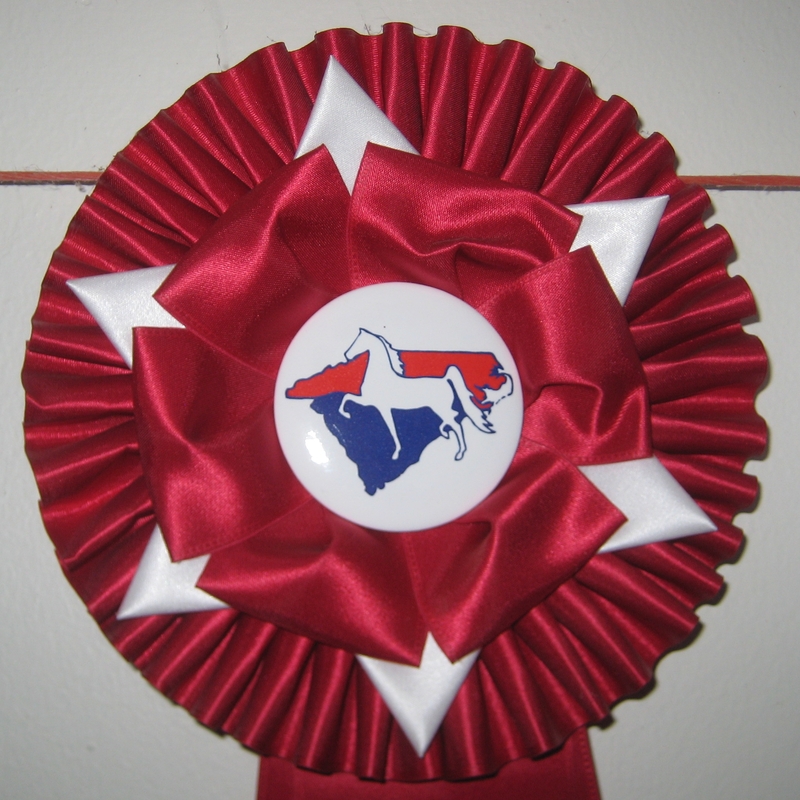 One thing on which we can all agree – saddleseat shows understand ribbons. Missing from the array is the blue from South Carolina [ASAC]. Since it was such a big, pretty ribbon [see inset of second place ribbon], I left it with my friend to show her granddaughter whose lessons at Stepping Stone were causative to my ending up there [Random]. “Here little girl, don’t you want one of these of your own?” That’s me, the horse show enabler. When I look back at the Winter Tournament shows, I see that I was a basket case [A Hot Mess]. Years back, I was interviewing for a job that I desperately wanted. I had to take a drug test. I had no reason not to pass, so I was sure the job was mine. I was equally and completely convinced that I would inexplicably fail. Being positive on two conflicting ideas at once? What can I say, I am vast. As this spring went along, my nerves never got any less. However, I began to believe that I could actually do this and it might even be fun. Dual drives of nerves and excitement. I think that might be the answer to riding in big shows such as Rolex or the Olympics. You are still nervous. From what I hear that never goes away. However, alongside of that, you have developed mental and physical skills you trust. Do you have any spring progress to report? Title: not perhaps the most appropriate quote for a generally mild-mannered site. Blame Alabama Phoenix Festival. Science Fiction conventions have a tradition of late night sing-alongs: My Little Pony/songs from Equestria, Buffy the Vampire Slayer/Once More with Feeling, and the granddaddy of audience participation, the Rocky Horror Picture Show. Skipping out for the horse show precluded my attending any evening events. Instead, I played Rocky Horror on the drives back & forth to APF. Ever since, I have had the entire album as an earworm. Photos: apologies for the blurry shininess. These are the best of the lot. Ribbons are even harder to photograph than LEGO bricks. Ah, I am inspired to do a post on my running medals (they are all “finisher” medals, to be clear). There are some really pretty ones. And I do confess to checking to make sure there is a medal at the end before I enter. I mean, what’s the point if you don’t take some small thing home with you?? Know what you mean about “participation awards”. I get blown out of the water a lot at the dance competitions (there is always a bigger fish with sharper teeth) but it’s nice to come home with something clutched in my hot little paw even if it isn’t a first place. Did you get the job, all of those years ago? Yes, thank you. It was at the zoo. Very instructive few years. Learned much about management/entertainment of the public. Thought I recognized the title.